"You know, you should really try to travel alone," the voice at the end of the phone said. "It's like the one thing that you must do before you die. Helps to connect with yourself and stuff. Besides, I am really busy with work. Would love to go, but can't. Sorry! Alright, have to go, catch up with you another time. Bye!" the voice went, followed by a click. Thane looked at his phone annoyingly, then back at the at the website he was on. As much as he hated being alone in unfamiliar places, he needed a break. Life has been pretty tiring for him over the past few months, especially after he made a mistake in the last contract. His boss has been furious with him ever since the incident, and he was already half expecting a termination notice to come soon. He needed to go somewhere. Anywhere. So he clicked confirm. "We wish you a pleasant stay in the city of Malacca and thank you for travelling with W Travel Agencies," the tour guide duly announced, waking Thane up from his slumber. Thane opened his eyes lazily and looked out at the windows. The three hour bus journey from Singapore has been surprisingly swift, or maybe it was because he slept for the entire journey. A collection of brown buildings stood outside of the bus, with the words Mahkota Hotel clearly emblazoned on one of them. He watched as the rest of the people on the bus idle slowly out with their bags and luggage, all wearing a collection of different sweaters and jackets to protect them from the bus's air conditioning. Some of them were in families, others with their friends, and there were two to three couples. Thane was the lone traveler in the entire bus. With his backpack around his shoulder, Thane slowly followed the last group of people out of the bus, a collection of senior travelers with graying hair, probably here as part of a tour group. They were excitedly conversing in Chinese about the town's history and about what to eat for lunch. His stomach rumbled excitedly to the word lunch,perhaps trying to add its own opinion to the conversation. Thane could only smile to his stomach's sudden reaction. He would make the most of this trip, he told himself. "Err... I'm sorry, but err... can only check in after two o'clock," said the receptionist. When Thane asked why, the receptionist seemed to have trouble to string a proper explanation in English. Thane felt that English was not the receptionist's strongest language. The pauses in between sentences and the hesitance made that apparent. Thane figured he could fare much better if he switched to the receptionist's native language instead. "Jadi kalau nak letak beg sini boleh? Dan boleh check in bila-bila kan selepas pukul dua?" Thane replied, asking whether he could keep his bags at the counter and check in closer to the evening. The receptionist gave a relieved smile when he realized that Thane could speak Malay, and proceeded to nod several times. "Kalau encik nak makan encik boleh pergi ke restoran Melayu kat sana tu," the receptionist quickly added, offering a suggestion of a good place to have lunch. His tone was much friendlier this time too. He pointed outside of the hotel, and Thane noted down the direction. Travelling in the country you came from sure has its benefits, Thane thought. At least he could still navigate around if he gets lost. He thanked the receptionist before dropping his bag off in the concierge, and proceeded out of the hotel. It was a hot afternoon that day. The sun shone fiercely down unto Thane as he walked past different museums as he explored around. The receptionist has been good with his suggestion, the food was superb, and Thane could already feel his mood lifting up. 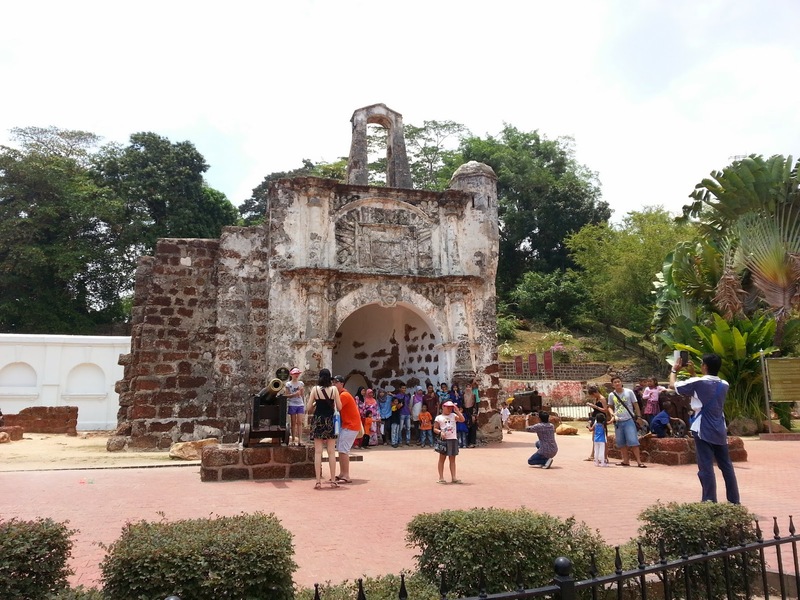 After consulting a map that he got from one of the many museums he passed by, he finally reached his destination for the day, the ruins of the A' Famosa fort. Built by the Portuguese in the 1500s when they first arrived in the Malay archipelago, it was a name that constantly appeared in Thane's history books back in his school days. Snippets of his previous history lessons came back to him, about how the Portuguese held on to Malacca with the help of this fort, and Thane couldn't help but to feel a pang of nostalgia. He had been here before too, how many times he could not exactly remember, but he knew that it has been almost 10 years since his last visit. His past memories of this place was fuzzy and unclear at best, and he found that he could not even remember who he was with during his previous trip. Thane walked slowly towards the fort as he slowly took in the sights and sounds around him. Trishaw drivers adorned the brick covered path near the fort with their brightly colored trishaws, each with its own theme and design. There were several pink Hello Kitty trishaws, some blue Doraemon and Smurf ones, while the remaining had floral designs on them. It was a good day for business, as Thane saw many tourists getting on and off the trishaws. The fort itself was filled with people, each trying to get a good spot to take a photo of the them together with the fort. Thane walked quietly around the outside of the fort, admiring the old beaten walls, quietly noting down that the walls was almost three hundred years older than him. As he stepped into the interior, he could hear a gruff voice singing a song that reminded him of his father, along with the strumming of a guitar. Street artist. Thane certainly did not remember seeing any street artist the last time he was around in Malacca. Thane stood for a while listening to the songs of the bearded singer echo off the walls of A' Famosa, before dropping a five dollar note into the man's casing. He later made his way up the hill behind the fort towards his second location of the day, the ruins of St Paul's church. Built also by the Portuguese, St Paul's church was one of the oldest churches to be built in Malaysia. It changed hands several times following the change of political power in Malacca, and in the present day only ruins of the church remains. Thane always felt sad when he thought about what was lost when the church was allowed to decay to the state that it was in today, because of the lost of the historical value that goes with it. The church was located on a hill overseeing the city, and Thane was very excited at the prospect of revisiting the church again. It was also the place where his story takes an unexpected turn. As he climbed the remaining staircases leading to the church, a pleasant melody drifted to Thane's ears. He recognized the tune as a tune coming from a guitar, accompanied by a female voice. She was playing a mashup song of Sam Tsui's Let It Go / Let Her Go, a song that he had only heard through his computer so far. He allowed the the music to fill his ears as he wondered past the congregation of tourists and stalls set up along the church, admiring the strange red colour that seemed to accompany old buildings in Malacca. It was in the main hall of the building that he saw the source of where the music was coming from. 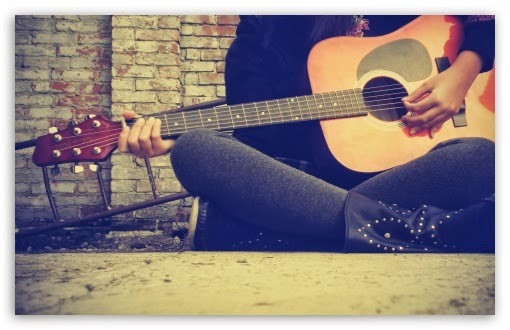 Amidst the old tombstones leaning on the walls, a girl stood near the corner of it, her hands skillfully strumming the guitar as she sang together with it. There were several tourists standing around her, taking her picture, before dropping some money into her guitar case and continued on their tour. The guitarist was drawing quite a crowd on her own, more than the man Thane had seen down at A Famosa street. Her blonde hair and pale skin may be the reason why, as she clearly stood apart from the tourists around her. Like most of the tourists that were around, Thane couldn't help but find himself wondering why a Caucasian was performing on the streets of Malacca. It felt strangely odd, as most Caucasians that Thane passed by were tourists, and a Caucasian street artist was a rare sight indeed in an Asian country like Malaysia. Somehow a street artist job was something Thane would not associate with Caucasians in an Asian country. Still, Thane did not do much as he listened to two more songs from her, before dropping another five dollar bill and moving on to his next destination for the day. As curious as he was, he figured it would be impolite to ask her why she was performing to earn money in the streets of Malacca. So he left, and soon after his thoughts were filled other things instead. Jonker Street was a busy street indeed. Thane has lost count of the number of times he accidentally bumped into someone and having to apologize for it. He guessed it was normal for a night market like Jonker, where stalls selling almost anything lined the sides of the road while people walked in the middle of it. Thane had already sampled several local delicacies like chendol and curry fishballs in less than 30 minutes, and already his stomach was complaining from the barrage of food that he stuffed down. He was looking for a place to rest when he heard the same voice and music coming from a guitar. She was standing in a small garden next to the busy street, singing the same song that he heard earlier today. Her guitar case laid in front of her, filled with the day's earnings. There was a small crowd around her as well, probably thinking the same thing as the tourists this morning. Even in such a busy street, she still stood out among the crowd. Thane's sense of curiousity was piqued again, and he lingered around in the small garden. Before long he realized that he was probably hoping that something magical would happen to him like in the movies, but if the past few decades of his life could be any of hint, reality is never like movies. So he convinced himself to walk away after three songs, but not before dropping a ten dollar bill into her guitar case this time. She muttered a thanks and smiled to him, and he smiled back. Thane wandered around the street aimlessly for a few moments after leaving the garden, and for some strange reason, found himself thinking about the girl with the guitar. The was something drawing him towards her, a question that he wanted to ask. Before he realized it, he was standing in front of the small garden again. She was busy packing up, and the people continued to mill around in between them. Speaking to random strangers was never his strengths, and it felt like forever before he finally gathered enough courage before walking towards her. "Err, hi?" he muttered to her, trying to force a smile out that felt incredibly awkward and weird. She smiled back to him, a friendly and radiant smile, and half of Thane's brain was already asking him to make a run for it. To save him from any further embarassment. "Yes? Anything I can help you with?" she asked, as she slung her guitar case over her shoulders. Her eyes were blue in colour, and she had tiny freckles around her nose. "Erm... my name's Thane... and I was wondering... because I saw you playing the guitar... and you know... it's rare to see a foreigner playing on the street... no offense I mean, but..." Thane stammered, before being cut off by her. "You're wondering why a girl like me, who is obviously not from around here, collecting money from playing guitar on the street?" she asked, helping Thane complete his questions. Thane nodded his head a few times. "Tell you what, there's a cafe near the place I'm staying, and if you don't mind, maybe you can treat me to a drink and we'll talk as we walk there?" she suggested, to which Thane nodded even more furiously to. The stars were clearly in his favor today, as things seemed to be going way smoother than what he had anticipated. So he followed her as they made they way along Jonker Street. The night was growing older, as the number of tourists were beginning to dwindle and some stalls were already packing up. "My name's Christine, by the way." They sat a cafe next to the Malacca river, overlooking the pathway that reminded Thane of the one he saw along Singapore river. She ordered a cocktail by the name of Blue Lagoon, and seeing that he did not have much of a choice, he settled for a Tiger. "I am street performer, but I guess that's obvious to you already, but I am also travelling around the world," she said matter-of-factly. "Travelling around the world?" Thane immediately blurted out in response. The idea of being a street performer and traveling the world never really clicked with him. To him, travelling is something you do when you had saved enough money. That was part of the reason why he was working. She smirked at Thane's reaction, as if it was not the first time she heard someone responding in particular. "Yes, I do, and performing on the street is how I earn enough money to keep travelling. Me and my dear Jamie against the world." "Yes, Jamie. This baby sleeping soundly in this case," she said, and patted lovingly on the case. Thane was skeptical, and raised an eyebrow to stress his point. But as she proceeded to show him pictures of the places she has traveled before, and he found himself marveling of all her adventures and journey. They talked well into the night, she about how she wants to do the things that she wants before she dies, Thane expressing his surprise at how easily she make everything sound. He asked her about her family, about security, how she lives by, and if she is ever afraid of what lies ahead. Thane could not bring himself to picture himself to be in the type of life she was living in, day by day, without knowing for sure what lies ahead. It seemed too dangerous, too risky, too unpredictable. "Life is about stepping about your comfort zone, you know, and living without regrets," she replied rather annoyingly, after Thane kept voicing his doubts. "If you keep wanting to stick to what you're comfortable with, you'll never know what lies outside of your comfort zone," she added. Thane could not stop thinking about Christine back in his hotel room that night. Some of her words stuck firmly in his mind, and it made him reflect on his life as well. He had a good paying job, his path charted clearly in front of him. Like many others that came before him, he would be repeating the same cycle. Save enough money, climb the corporate ladder, get married, have some children, retire and travel around when he's older. Just like the group of uncles and aunties he saw on the bus earlier. It was a road well taken. It was comfortable, it was predictable. The road is well lit, well maintained. If he was to stay on this road, there's little chance things would go wrong. He thought about the other road. The road Christine was taking. Like the offbeat mountain track, it is much more dangerous. Risky and unpredictable as well. There was less security. You will never know what will hit you tomorrow, and all you can do is to live out everyday as you can. But the road offered much different things as well. With risk comes more excitement, and something that you can never see everyday. Thane could feel two sides of him arguing, and eventually the both sides grew tired of the never ending debate, and he drifted off to sleep. "What are you doing here with that violin?!" Christine asked Thane the next afternoon. They were standing at the Dutch gardens, with Christ Church overlooking them. There were crowds of tourists as usual going about their business as usual, taking pictures of the church and the fountain, with occasional glances to the couple holding a guitar and a violin. Out of pure random impulse, Thane actually went to the mall next to his hotel and brought a guitar from a random music shop. The shopkeeper was delighted at this seemingly expensive purchase from a young man, who just went in and swiped his card without question. It was going to blow a big hole in Thane's pocket, but somehow he did not care. He wanted to explore the path less taken. "Mind if we play together?" he asked. Christine looked at him with a frown, but eventually the frown gave way to a smile. She shrugged, and walked to a side to let Thane stand beside her. "Just make sure you can keep up, or I'll have to kick you out of the band," she teased him, before proceeding to play the intro to Katy Perry's Fireworks. To her amazement, Thane managed to keep up with her, and the music from the guitar and violin danced together to produce something magical, as crowds gathered around them to listen. Thane silently mouthed a thanks to his mum for forcing him to go to all those violin lessons when he was young. "We got almost 500 dollars here!" Christine squealed in excitement. The day was approaching night time, and they were resting from their earlier gig at the Dutch Gardens. "We made 500 dollars!" she exclaimed again, her smile brimming from side to side. In her excitement, she held Thane's hands and danced around him, before realizing what she was doing and quickly pulling her hands away. "I guess you aren't that bad after all," she said, to which Thane gave a sheepish smile. "How about we play together tomorrow as well? Before I leave Malacca? I think we make a perfect team," she suggested. Thane said he would be more than happy, and so they played for the next two days. Thane had always enjoyed playing the violin, and there was once he wanted to be part of the band, before giving up the dream after realizing how tough it was going to be. There was simply no way he could have survived in a band, so he became a banker instead. Playing with Christine made him relive the days when he was back studying, when he could do what he loved without caring about responsibilities. It made him happy. They played at the A Famosa, they played in front of the various museums, they played near the cafes. Wherever they played, a small crowd would always formed around them, wanting to take pictures of them, with them. Thane hoped that it would never end. But it did, and before he knew it, it was his final night in Malacca. "You know, you could always quit your job and travel with me though," Christine said to him that night, as they were walking along the river of Malacca. "I must admit, travelling alone can get quite lonely sometimes," she said. The last boat from the river cruise made its way along the river, the sound from its engine and flashes from the cameras of its passengers breaking the monotony of the night. "I don't know," Thane responded, his voice trailing off before he could make any more serious response. He thought of his job back in Singapore, of his plans that he had so carefully put together. He thought of the familiarity and security of it all, and wondered if it is indeed what he hoped for. "Think about it," Christine responded, before putting her hand Thane on his shoulders. She slipped a paper into his hands, and planted a kiss on his cheeks. "It has been great knowing you though," she whispered. "Our journey back to Singapore will take roughly about three hours, and we are hoping to make it before the rush hour," the young girl in the floral shirt announced over the speakers. Thane was already sitting in the bus, unable to shake yesterday's memories out of his mind. The burden of choice has never been more pronounced on him. He looked at the paper given by Christine, her number beautifully drawn across it. There already a few wrinkles on the paper has he held it for the longest time possible, trying to come up with a decision. On one hand, he could go back to the life he has always known, to life that was predictable. The safer road. The road most people are on. Or he could take the path of the well maintained road. The riskier road, where both adventure and uncertainties await. Would he be happier? He would never know. His heart was screaming at him to venture off the beaten path, to step out of his comfort zone. But another part of him was afraid of lies beyond. Would he regret the choice? Would he only be making a mistake by doing things recklessly? "We will be departing in five minutes," came the monotonous announcement again, and Thane thought of the time he had in this few days and the time he had while he was working back in his office. He took out his phone, and dialed the number on it.